18k yellow gold bracelet, 7" in length, containing 54 Rubies weighing 3.25 carats and 54 diamonds, weighing 2.70 carats. The precious gemstones are prong-set in clusters of three, in alternating colors of ruby and white, Clarity is SI. The bracelet weight is 12.40 DWT and contains a combined total of 5.95 carats. 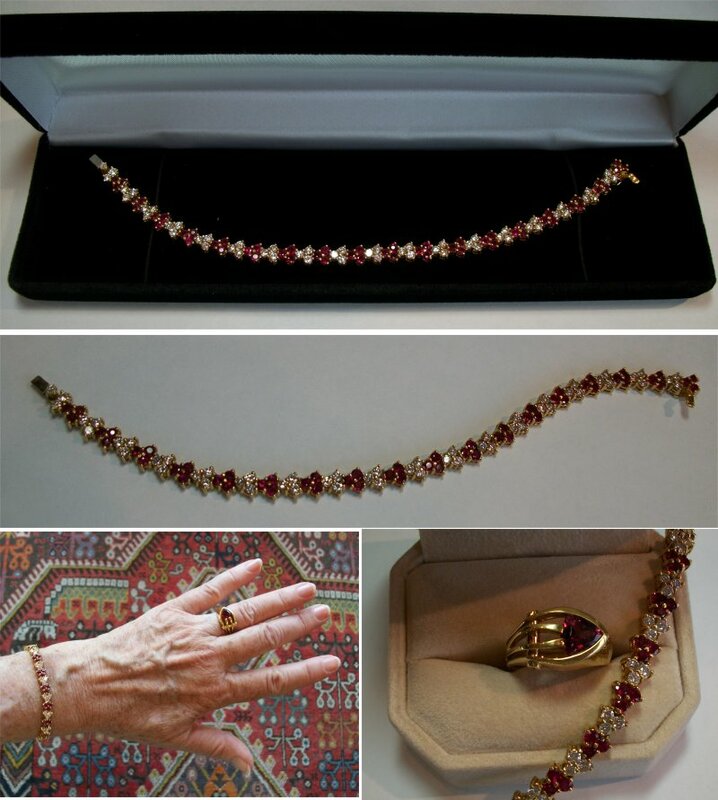 The appraisal for this item reads as follows; "Ladies 18k yellow gold ruby and diamond bracelet. The bracelet contains 54 round brilliant cut diamond being 2.70 ct and H-I in color and SI1 in clarity and 54 round vivid red rubies being 3.25ct and all matched for color. The link holds three stones per link and are in a triangular shape alternating from diamond to ruby." This bracelet was appraised for $6500. in January 2005. (In 2005 gold was under $550/oz. Today's market is around $1700/oz). Please see our other listings for the custom made 18k ring which appears alongside the ruby and diamond bracelet in this photo collage.